This quarter we are tackling The 6 Pillars of Character by the Josephson Institute. We will be doing various tech projects while learning about Trustworthiness, Respect, Responsibility, Fairness, Caring and Citizenship. Students in grades 4th-8th will be creating journal entries and working on projects related to the pillars. Grades K-3rd will be learning the pillars of character through books and websites. 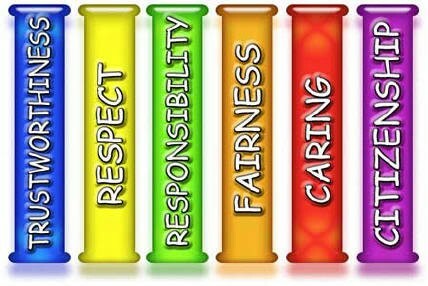 Check out the Josephson Institute's website at www.josephsoninstitute.org for more information on character education. Just a reminder that students in grades 4th-8th grade are required to bring a flash drive to class every time they attend class. All assignments are graded on their flash drives. Students in grades 2nd-8th are required to bring their Kinzie planner so they can copy down websites we use in class. Finally, headphones are recommended for all grades, and can be left in my classroom. Please take a moment to provide CPS with your input regarding the 2014/2015 school calendar. Go to http://www.surveymonkey.com/s/cps-calendar and take the 1 question survey. You will need your child's ID#. Look at the top of your child's report card to locate the student id number. Thank you in advance for your time! Did you know in the very near future, as soon as 2015, students in 3rd grade through high school will take the PARCC (Partnership for Assessment of Readiness for College and Careers)? This test will replace the ISAT (Illinois Standard Achievement Test), and will be taken on the computer. YES, that's right...on the computer! Now more than ever students need to be familiar with how to operate the functions of a computer. Below are great sites with educational value that can help students become familiar with various computer functions. Please continue to check the web address to make sure your child stays on the educational site. If a pop-up ad is clicked it could take your child to a site that does not have any educational value, or a site that inappropriate. Parental monitoring is needed any time a child is on the computer. Google the words: Sunset Valley Elementary School Computer lab then click on 1st grade, and then on TumbleBook. If you enter this link through first grade you do not need a username or password. THIS IS AN AWESOME SITE! This site has a variety of leveled books for all ages with an audio component! Yes, that's right...it reads the book to your child or you can opt to read it yourself. Check it out! It's on of my very favorite sites! The rest of the computer games are grouped according to grade level. All of the games are fantastic for learning. Don't forget to visit the typing sites! Google: Mt Vernon Computer Lab and check out the grade level games. I really enjoy this site too. Finally, keep a small notebook near the computer and keep a journal of sites that have educational value. As always, please feel free to email me if you have any questions, concerns or just need some information.